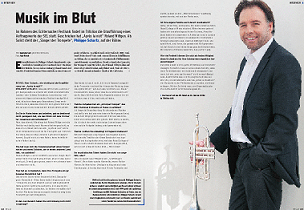 "Trumpeter Philippe Schartz... a real musician with a golden sound and remarkable musicality." Noord Hollands Dagland - Concertgebouw Amsterdam 25th May '99. "Schartz raises his eyebrows and plays Hummels Trumpet Concerto with amazing virtuosity..."
Süddeutsche Zeitung - Münchner Mozart Festival, Gasteig 29th September '99. "Much applause for pianist Olli Mustonen and trumpeter Philippe Schartz at the end of Shostakovich's Piano Concerto No.1." "...eccellenti il trombettista Philippe Schartz." La Nuova Ferrara April '99. "Philippe Schartz...played the Trumpet like a Violin." Eduard Schmieder, Guest conductor MCO, Landshut Munich October '99. Meadows Distinguished Professor of Violin and Chamber Music Head, Dallas, USA. "Philippe Schartz...played the Telemann Trumpet Concerto with calmness and pure sound and intonation. His high note register had the clarity of a flute sound...perfect and virtuous." "The solo trumpet of Philippe Schartz blazed like a Spanish bullfighter fanfare...It made the palms sweat." Evening Standard July 2000, BBC Prom Concert. "Philippe Schartz's third movement trumpet tune, thrown out with the careless bravado of a Latin bandleader." "A special mention for the glorious trumpet of Philippe Schartz in the louche second movement and elsewhere. Altogether thrilling stuff." Western Mail (Cardiff), December 2000. "The confident brass entries, the interwoven, varied voices of the instruments and the richness of the sound world were most beautiful to hear"
"Finally, the trumpets provided a jubilant ending to the piece, with commendably sure intonation"
"...the brass section were first class"
"Whenever the brass section put in an appearance, the orchestra took on a round and noble sound"
"The brass - superb trumpet soli and glorious trombones - soon showed its paces"
"The BBC National Orchestra of Wales played beautifully...their sound homogenous, brass motifs immaculately delivered"
Harrison Birtwistle's 1987 score Endless Parade was commissioned by the legendary Paul Sacher, and its Zurich premiere was conducted by him, linking the piece with some of the seminal works of the 20th century. This symbolic connection was honoured when Sacher's Swiss compatriots Thierry Fischer and trumpeter Philippe Schartz performed Endless Parade with members of the BBC National Orchestra of Wales in this contemporary programme. The title reflects Birtwistle's encounter with a festive parade in the medieval Italian town of Lucca, and the various aural perspectives afforded by meeting the jostling procession at different junctures. It is the tension between conjunction and disjunction of ideas which drives the musical process and the energy created in the interface of trumpet and chamber strings was positively bristling. However, it was the dynamic of the relationship between trumpet and vibraphone, the other instrument in the lineup - and as such a sort of mediator - which made the spine tingle. The vibraphone fired off fierce volleys of notes, but sometimes acted almost as an echo, or alter ego, taking up a single note just as the trumpet breaks off in a way that left the sound reverberating in a rainbow haze. The exquisite poise that Birtwistle achieves in such moments was certainly realised, with Schartz's brilliant playing rivalling that of its first executor, Hakan Hardenberger. There is a world of difference between the gifted amateur and the seasoned professional player. You don’t survive long in the professional ranks without being more than just a promising unfulfilled talent. The brass sections of the top European symphony orchestras are no place for the Corinthian spirited - only hard nosed realists survive. Playing music for a living rather than a pastime requires flint in the heart and ice in the veins. These are no places for flaws and imperfections – it’s the Darwin principle of brass playing: only the strongest and the best survive. Philippe Schartz is one of the players at the top of the musical food chain in the world he inhabits. His background laid the solid foundations to his craft: from enjoyment and progression as a young player in his home country of Luxembourg through the hardest of selection processes as an aspiring trumpet player in Europe and America to finally becoming a principal performer with a leading National Orchestra. The mature performer we hear today is a highly skilled practitioner of his craft. Forget the inherent talent and the innate musicianship – he has those virtues in spades; here is a true top class professional trumpet player, illustrating just why he is considered such by his peers. This impressive and enjoyable release showcases all his skills: From the sheen of his vibrant tonal quality to the solidity of his note production, the wide range of timbres to the full spectrum of his mastery of genre. These are performances of intellect as well as passion. The opening ‘L-Fanfare’ (the L is for Luxembourg) comes form the pen of Roland Wiltgen, as does the later ensemble work ‘Schmelz Trilogy’. Wiltgen is no stranger to the brass band medium, composing the ferocious ‘Red Earth’ for the 1995 European Brass Band Championships – a test piece still spoken of in hushed tones by those who played it. Here the cleverly constructed four part fanfare opens the CD with a dark opaqueness, coldly dislocated yet strangely engaging. This is followed by two contrasting works by Marco Putz and Trevor Ford. The Putz ‘Trumpet Concerto’, although modernist in approach, is still engaging and accessible to the listener. Written in three parts it asks much of the performer, highlighting the need for the highest values of technical security in the outer sections, allied to a dark, rich sense of lyricism in the Bach inspired middle movement. The finale in particular demands much of the performer in terms of stamina, especially the coda where breath control that would make a pearl fisher gasp for air is needed in the thrilling climax to the work. The Trevor Ford ‘Concerto for Trumpet and Band’ is cut from a less complex strata of musical rock. More readily accessible and transparent it is a three movement work that is a mix of European Australianism in structure and approach. Not surprising given the composers background the opening ‘Soliloquy’ in particular owes much to the western shores of the Australian continent; an open, lyrical approach based on a simple, yet arresting melodic line. The ‘Intrada’ reveals a more European flavour in style before a lively ‘Rondo’, playful and witty, closes the work somewhere between middle England and the Norwegian fjords. Throughout the release, the soloist is accompanied with admirable skill and deference by the Military Band Grand Duchy Luxembourg. In Wiltgen’s ‘Schmelz Trilogy’ they reveal an admirable capacity to invoke colour and drama, as well as a detailed appreciation of balance and disciplined precision. The ensemble work takes its inspiration from steel making (the word schmelz means steel factory) and evokes the harsh industrial processes at work as well as the almost forlorn destruction of the once beautiful countryside that made way for its coming. The final work ‘Trumpets on Trip’ is a gem. Written with a dry wit by Jean-Paul Frish the five movement work is a playful, yet remarkably meaningful pastiche of styles and genres. The ‘trip’ is musical rather than chemically enhanced, from the basic simplicity of Luxembourg folk songs to snippets, nods and winks of classical repertoire and trumpet concerti to jazz and ceremonial fanfares. Throughout the recording Philippe Schartz is a deeply impressive performer, both as a solo voice and a sympathetic and generous ensemble player. The accompaniment is also of a very high quality, as is the post production process, sleeve notes and sound engineering. A very professional, professional in fact. The Royal Military Band of Luxembourg is amongst the finest professional military bands in Europe and under the outstanding leadership of Col. Reichling they produced a superb and memorable performance. To most people a fanfare is a ceremonial style of work, usually little more than a flourish. Roland Wiltge's 'Fanfare' is far more dramatic and complex commencing calmly and solemnly but gradually building up into a frenzy. To fully appreciate it one needs to listen carefully to it several times. The two concertos by Marco Putz and Trevor Ford are in the traditional three movement form by quite different in style. The first and third movements of the Putz concerto are quite modernistic but tuneful with a serence slow second movement based on J S Bach's chorale, 'Oh Haupt voll Blut und Wunden', Trevor Ford's is more traditional in form with an Intrada, Soliloquy and Rondo, and should soon make its way into the standard military band repertoire. 'Schmelz Trilogy' is also in three movements but would be better described as a description suite for trumpet in that the three movements Intrada, Passacaglio and Saltarello depict the countryside of southern Luxembourg. The word Schmelz is a Luxembourg word meaning Steel Factory. 'Trumpets on Trip' is a five movement work in which Jean-Paul Frisch skilfully weaves in snippets from classical works, trumpet concertos and Luxembourg melodies. Written for four trumpets it is an ideal ending to this programme. The playing of the soloists is superb throughout with Philippe Schartz making everything sound ridiculously simple and of course to him it is - lesser mortals have more problems. The Band accompanies the soloist(s) sympathetically, delicately and never intruding on the soloist. Doyen can always be relied on to produce a first class recording and the engineers have captured the sound beautifully. The inlay written in English by Philippe Schartz has details on all the composers, the works, the Band and himself. This is a real joy to listen to and will break down barriers that exist between military bands and the classical world.